Merry Christmas to all you folks who make my small efforts worth the time. Brandon McCarthy makes his first major league start since April 25, 2015 when he went on the shelf for Tommy John surgery. He insists he’s looking at this game as just another start. Right. He’ll face the Rockies’ Jon Gray (5-3, 4.83 ERA). Gray has pitched at least six innings in all but one of his last seven starts. Corey Seager got a hit in his 15th consecutive game Saturday night and now holds the longest current hit streak in the big leagues. The Sunday Night Baseball game between the Braves and the Marlins wouldn’t ordinarily hold my attention, but it’s being held in a ballpark which was built at Fort Bragg, NC in just four months. It replaced an overgrown golf course on the base. It marks the first time a professional, regular-season game in any sport has been played on an active military base and is the first time the state of North Carolina has hosted a regular-season Major League Baseball game. What’s going to happen to it after the game is played? …the site will be converted into softball and multipurpose recreational fields following Sunday’s game. The playing surface will remain, along with the foul poles, dugouts and bullpens, as a lasting reminder of Sunday’s historic event. Okay, Imma gonna wanna to see this. Gonzalez will be the Dodgers’ DH, but the first base job is between Utley and Turner. Meanwhile, Russell Martin returns to the catching position for the Jays; he took Dickey’s start off. From pink bats to specially-designed uniform logos to honorary bat girls to “Pink Out” days in the stands all of MLB will celebrate Mother’s Day in one way or another. Someone please post the lineup in the comments if I don’t get to it before the game starts (7:10AM my time). 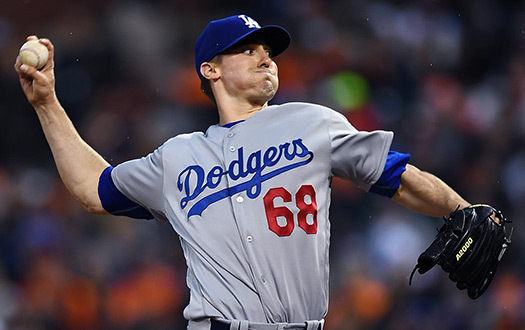 The Dodgers’ Brett Anderson was a member of the Rockies last season, but injuries to his finger and his back cut his season short and they let him depart at the end of the year. Anderson is 1-1 with a 4.21 ERA for the Dodgers. His opponent will be Eddie Butler, who’s 2-2 with a 3.81 ERA. Kendrick gets a day off and Turner plays second in his place. Adrian Gonzalez celebrates his birthday but doesn’t get the day off, and the Dodgers got their pink Mother’s Day gear today. I hope everyone enjoys their evening and wakes up tomorrow with a minimal hangover. For 2014 let’s hope the Dodgers solidify their infield and win the West again this year, and then go further and get to the World Series for the first time in 26 years. If you’d told me in 1988 that the team wouldn’t get into a Series again until at least 2014 I’d never have believed you. Yes, Virginia, there is a Santa Claus, and this year his name was Guggenheim Partners. If you want to read the whole story behind Virginia’s letter to the New York Sun, I’ve posted it at my place in the past. Update: Mark Saxon at ESPN LA has a good if brief timeline of the Dodgers’ 2012, from McCourt’s agreement to sell to the latest off-season move. I hope you’re all enjoying your turkey/ham/prime rib dinner and giving appropriate thanks for the blessings of the year just past, not least of which was the sale of our favorite team to owners far more committed to winning championships than the previous group was. In six months, the Guggenheim group would have turned a $2.15 billion investment into a cash cow which pays three times that over the next twenty years – without selling a single ticket, parking spot, beer, or replica jersey. That is startling, at least to me. We all knew the potential for that deal was big, given the size of the Southern California market and its value to a TV network, but still. “Between $6 billion and $7 billion over 25 years?” Wowsers. Josh Bard, previously announced as a new special assistant for player development, joins Aaron Sele, Jose Vizcaino and Juan Castro in that role. Do you supppose that position is now the entry-level front office position for newly-retired major leaguers who earned reputations as good guys during long careers?